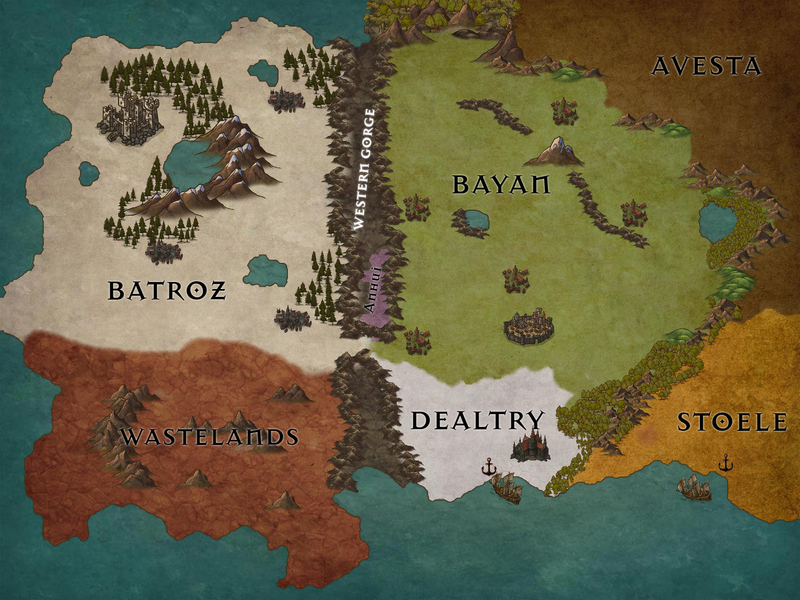 I have something fun for this week's update - a map! DR takes place on the continent of Hania, more specifically the southwest portion of it. This is the very high-level map we've been using when planning timelines, character movements, and other spatial references. Dealtry, Batroz, and Bayan should all look familiar, but they're not the only countries involved and impacted by the current conflict. Anhui is a small country located in the mountains of the western gorge, and while the rough terrain has mostly protected them from Batroz's march, they've seen their fair share of battles. They've since allied with Bayan and are holding position at Likanance, Bayan's most westward city. Stoele is actually Dealtry's parent country. About 80 years ago they split in two, with the MC's family becoming the ruling party of Dealtry. As they are both mercantile countries, Dealtry and Stoele maintain a strong relationship based in trade. While the merchant princes of Stoele are concerned with Batroz's actions, they've done little outside of lowering taxes to their goods. Only a small fraction of Avesta is visible on this map, and it's a fair representation of how much attention Avesta is paying to the current conflict. Most of their time and resources are spent holding their country together, and many suspect the Empress will flat-out refuse to move until Batroz knocks on her door. As for the wastelands, well, there's plenty of rumors of folk who've tried to navigate them, but rumor is all that's left. Several textbooks and elder elves claim that's where one of the kingdoms of the orcs lie, but it's been 150 years since anyone has seen any sign of them beyond the research they left behind, and there's plenty of arrogant humans slobbering to take the credit in their stead.